The students in Nelsons class measured their height in centimetres and entered the information in a chart. Some students decided to create a frequency table using the data. What interval was used to create the frequency table? How many students had their height measured? What percent of students are between 170 and 179 centimetres tall? Other students decided to create a stem-and-leaf plot using the data. What interval was used to create the stem-and-leaf plot? How many students are taller than 170 cm? How many students are shorter than 150 cm? What is the range (in centimetres) of the height of the students? 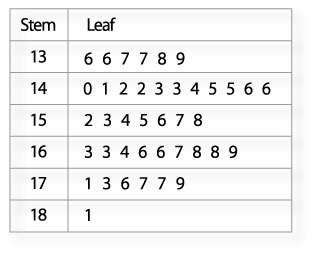 If you created a bar graph from the stem-and-leaf plot, with the stem as the horizontal axis, which bar would be the shortest? If you created a bar graph from the stem-and-leaf plot, with the stem as the horizontal axis, which bar would be the longest?